This commemorative plaque was set in place in the month of January 1981. 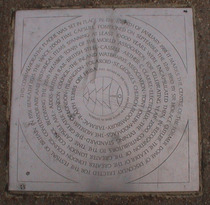 It marks the centre of the former Dome of Discovery, erected for the Festival of Britain in 1951. 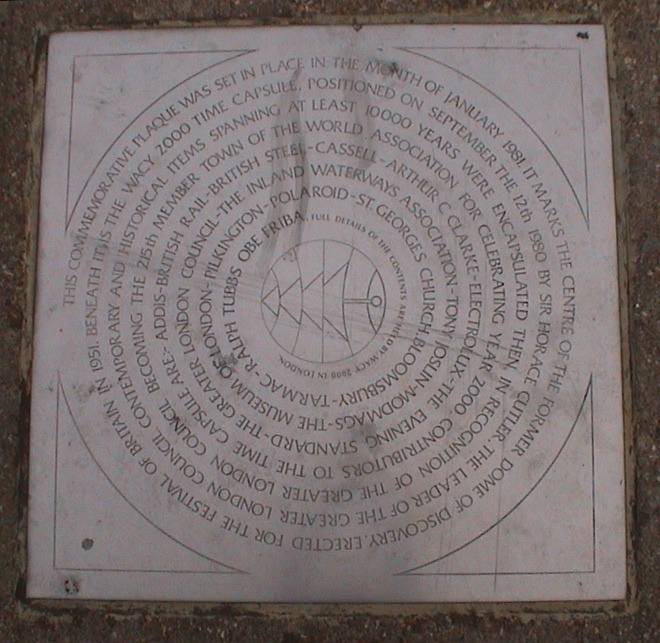 Beneath it is the Wacy 2000 time capsule, positioned on September the 12th 1980 by Sir Horace Cutler, the Leader of the Greater London Council. Contemporary and historical items spanning at least 10000 years were encapsulated then, in recognition of the Greater London Council becoming the 215th member town of the world association for celebrating year 2000. Contributors to the time capsule are: - Addis - British Rail - British Steel - Cassell - Arthur C Clarke- Electrolux - The Evening Standard - the Greater London Council - The Inland Waterways Association - Tony Joslin - Modmags - The Museum of London - Pilkington - Polaroid - St. Georges Church, Bloomsbury - Tarmac - Ralph Tubbs OBE FRIBA. Full details of the contents are held by Wacy 2000 in London. We found this plaque in 2010 and photographed it but following the pre-Jubolympics sprucing up of Jubillee Gardens in 2012, the plaque disappeared, or at least we can't find it. And we know where it ought to be because it tells us! Rather than photograph an empty spot we've used a plan of the Festival of Britain site so you can assess for yourself whether we've got the pin in the right place, and can even go and see if you can find it. Of course this assumes the plaque has not been re-instated in totally the wrong place. Please report back. 2013: we still can't find it. The plan comes from a page on British Archaeology dedicated to the South Bank Exhibition and the archaeological interest, or the lack of it, in the site at the time. Oh, the irony. Erected for the Festival of Britain in 1951. Leader of the Greater London Council, 1977 - 1981. This was the site of the Kilburn Wells. Greater London Council Sir Henry Dale, 1875 - 1968, physiologist, lived here.